Today is July 6th and the summer has officially begun. How do I know this? Mainly because when you walk the streets of Madrid you see very few cars, very few people on the streets, and many many available parking spaces. They say August is the month when more Madrileños go away on vacation for the month, and I believe it, but already now in July it’s nice – although HOT. 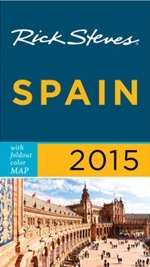 These summer months is when it almost seems there are more tourist in Madrid than Spaniards! It’s also the time when many of your favorite restaurants or bars may close for up to a month causing great disappointment when you’re hoping to take visitors out for a nice meal or drink. Another exception to the “Quiet Summer” rule was last night’s Gay Pride Parade in Madrid. I didn’t attend this year – the first time in 3 years – but understand it was nearly as “big” as last year’s Euro Pride Parade in Madrid. And, for anyone wondering, probably the great majority of spectators at the parade are NOT gay – like me. It’s just a good time, a great party, and you DEFINITELY see things you DON’T see on the streets of Madrid on a regular basis. Some nights are uncomfortably hot without the fan or without the air conditioning. Only a few nights – SO FAR – have I spent in the OTHER bedroom where there’s air conditioning. Otherwise, I’ve been able to bear under the heat with just the fan. And only a few night so far have I slept with nothing more than open windows – like the last few nights. As many of you know, MadridMan is a Hot Body and so I have a very low tolerance for heat. Shorts, loose shirts, and sandals are the typical daily wear in the street. When going out at night or to a nice lunch I’ll typically wear my wonderfully comfortable and light LINEN pants with sandals. The linen pants wrinkle like crazy but they’re almost better than wearing shorts. I love them. Many friends are away on vacation for the month of July or August and so summers can be a little lonely here in Madrid as I rarely take more than 1 week vacation for myself in summer. I always plan – with good intentions – to spend the summer working very hard, taking advantage of the relative quiet. But often, with such heat, I find myself almost less productive than otherwise. And while I can turn on the air conditioner in my work room I don’t generally like to use it because of my environmental responsibilities. When in the street I always carry a cloth handkerchief to wipe the sweat from my brow often bringing strange looks from those around me. And I’m usually the only person doing this. Why? It’s because SPANIARDS DON’T SWEAT! Okay, this is a generalization, sure, but it’s nearly true. It could be 100ºF in the street and not one Spaniard on the street will have a single bead of sweat on their foreheads – while I have drops of sweat streaming off the tip of my nose or down my temples. It’s the same in the metro when I’m there in my shorts and shirt, sweating, and Spaniard men are wearing full suits and ties and totally dry-looking. Spaniards – and people in general – LOVE to complain about the heat. Some people habitually repeat, every 5 minutes, “Ay, ¡qué calor!” – “Oh, it’s so hot!” I usually just internalize these statements because WHY say something, particularly repeatedly, which is so totally obvious. I say, just take it and go on. So yes, IT’S HOT here in Madrid and in many places throughout Spain in the summer, more in the south and less in the north, but hot it is. The ONLY saving grace here in Madrid is that the air is incredibly dry so the heat really isn’t as uncomfortable as it is in, say, humid Barcelona. In fact, the air is SO dry here in Madrid you can see it clearly in the mirror with dry, flaky skin and also with a desire to constantly drink water. I probably drink 2-3 liters of water daily! That’s a lot of water! But it’s got to be done. 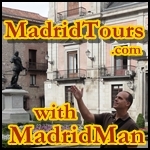 Stay Cool while in Madrid! This entry was posted in About Spain and tagged air conditioner, heat, holiday, hot, Madrid, summer, summer holiday, summer vacation, vacation. Bookmark the permalink.